Band practice for the Idaho Stop. 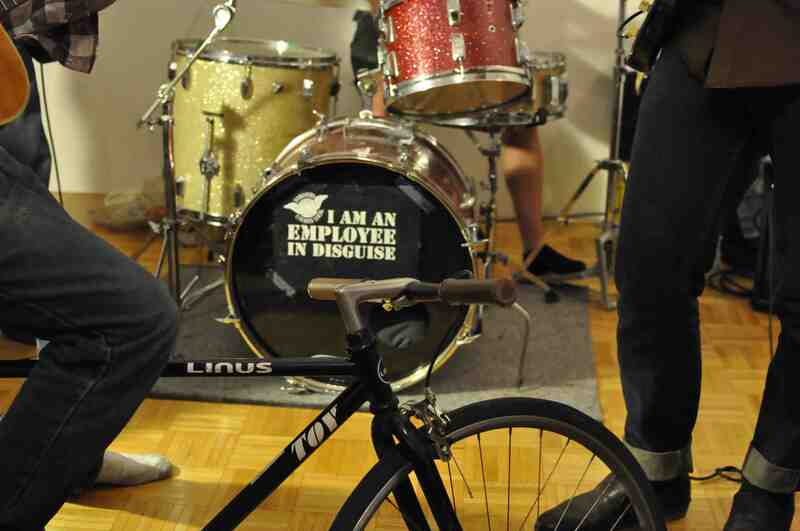 "I am an employee in disguise" poster on drum set in preparation for the strike-fund benefit. What: Strike-Fund Benefit concert featuring Idaho Stop, Abdominal and the Obliques, Sunny D and Uncle Dropsi, Dan Greer. This month, Friday the 13th looks like it could be a lucky day for our city’s couriers. 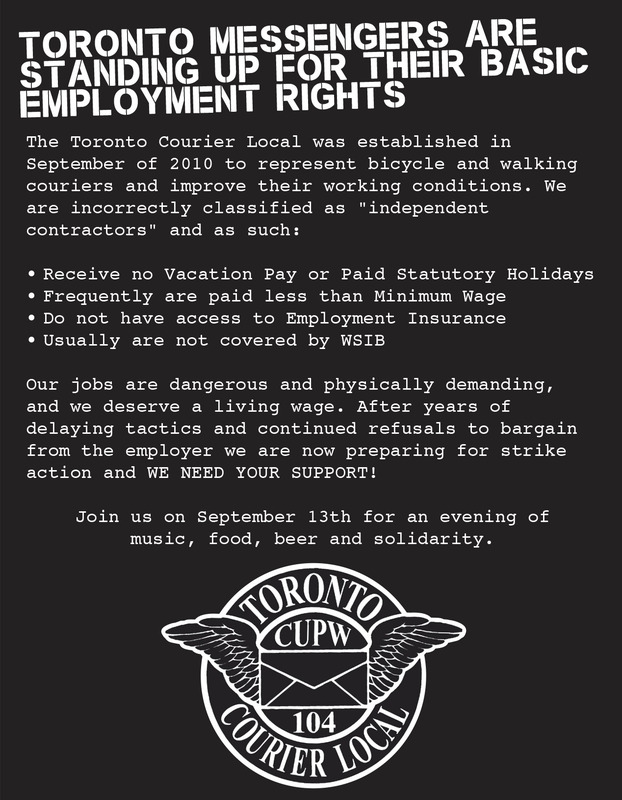 A “strike-fund” benefit concert -- organized by the Toronto Courier Local (part of the Canadian Union of Postal Workers) -- will raise money for couriers who are financially stricken and unable to engage in collective action for their own employment rights. 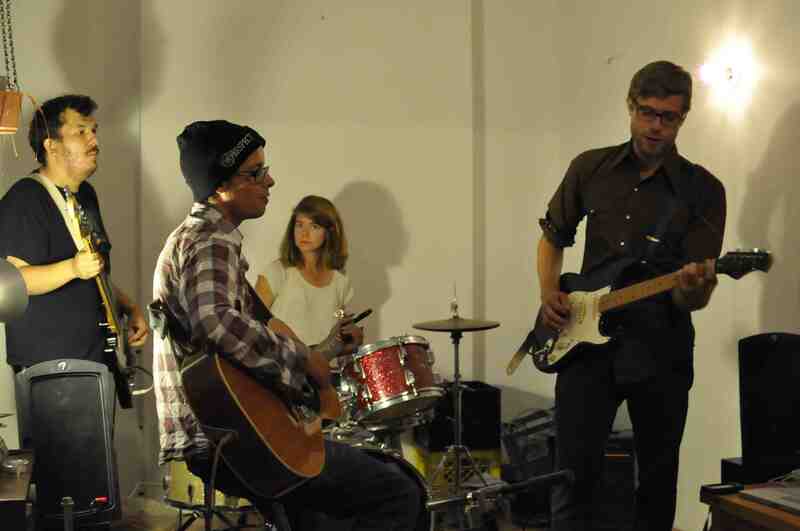 “The benefit concert is something we’ve talked about for a while. We’ve had a union certification for over three years now, yet there’s been no meaningful movement in collective bargaining with the employer on our core issues; employment rights,” says bike messenger and event organizer, Kevin Barnhorst, who is President of the Toronto Courier Local. Specifically, the main issues Barnhorst says that couriers want addressed are: lack of vacation pay, statutory holiday pay and making a living wage. Indeed, Friday's kick-off is meant to raise spirits as well as funds for the tightly knit courier community. Dalton and Barnhorst will be playing at the benefit as “Idaho Stop,” in a lineup that includes other courier-friendly musicians, Abdominal and the Obliques, Sunny D, Uncle Dropsi and Dan Greer. Dalton decided on the band name after hearing about the Idaho Stop. The law in that state allows cyclists to treat a stop sign as a yield when cars are not present, which has improved safety. (Read our dandy story “Rolling stops yield better safety” here.) Dalton and Barnhorst agree that the rolling stop mentality is how most cyclists approach stop signs, even those outside of Idaho’s state lines. Policy aside, riding the streets alongside cars for 40-plus hours a week is a dangerous endeavor. Barnhorst recently suffered a broken hand after getting doored on the job. He spent two weeks recovering, and is now delivering by foot. “I’m lucky,” Barnhorst says. He had some savings, where many couriers do not, and he also qualified for the Bike Messengers Emergency Fund (BMEF) an international organization that provides injured messengers with a cheque during the first week of their injury. Joel Dalton (left) and Kevin Barnhorst (right) practicing with the Idaho stop, whose members also include Will Culbert, Pen Lascano, Austen Valentine, Jen Hickey and Roberto Granados-Ocon. Some couriers can’t afford to take time off after an injury, and are left with few choices when they’re not covered. After an injury, some get back on their bike, risking permanent damage to their bodies. Barnhorst adds that he did receive a cheque from WSIB, (Workers Safety and Insurance Board), but it didn't come for over a month after the accident. 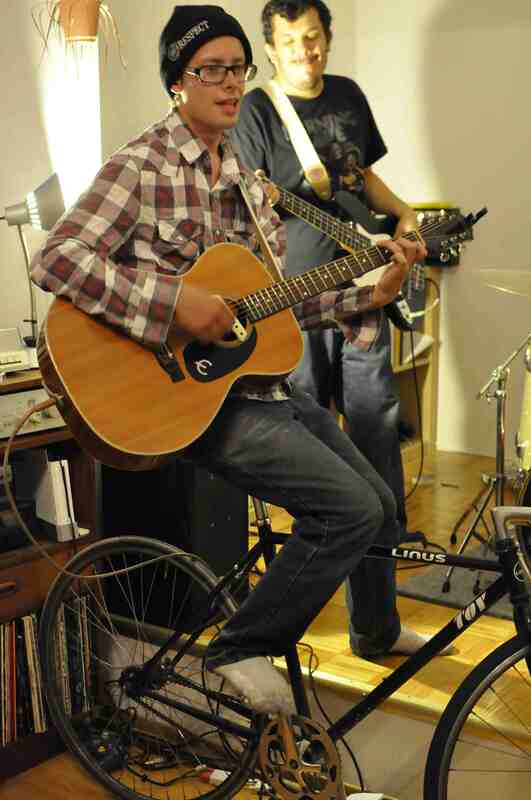 Joel Dalton, bike messenger, vice-president of the Toronto Courier Local and guitarist for Idaho Stop. “Basically, all of the risks of doing business are passed down to the courier,” Barnhorst says. The Toronto Courier Local hopes to deliver a message to the companies -- notably Toronto’s Quick Messenger Service -- who employ and exploit them: “We want to demonstrate to them that we have a lot of support from community allies who are on our side.” Barnhorst says they also hope to “shine a light” on an industry that very few people really know the details of. Is the Toronto Courier Local accepting donations for the strike fund, online or by other means? Good call on the comment Jamie! I’ve updated the piece to include this information. Thanks!